 A lackluster retelling of a celebrated stock-rigging case and its aftershocks, which rippled through Los Angeles for the better (or worse) part of a decade, from the author of Baseball's Great Experiment (1983). Tygiel (History/San Francisco State Univ.) 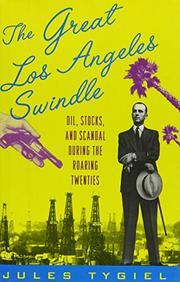 offers a detailed albeit uninflected account of the Julian Petroleum fraud that flowed from Southern California's pre-Depression oil boom. He recounts how a Canadian hustler yclept C.C. (for Courtney Chauncey) Julian parlayed folksy newspaper ads and some fortuitous wildcat successes into the dubious energy enterprise bearing his name. Despite a devoted following among trusting souls with high hopes and short bankrolls, the master of the promotional game ultimately lost control of his precariously capitalized company to an even shiftier predator, S.C. Lewis. Lewis routinely released false financial statements, rhapsodized about illusory mergers, and issued appreciably more shares than authorized by the corporate charter while pools organized by rival brokerage houses made huge profits trading in the watered stock. The bubble finally burst in mid-1927, resulting in a wealth of recriminations, several tabloid- quality deaths, scores of indictments, but precious few convictions. Tygiel does a tolerably good job of tracking those who played peripheral as well as leading roles in the megabuck ripoff. Unfortunately, his fact-filled narrative (with illustrations throughout) lacks any systematic perspective on either the socioeconomic factors or absence of regulatory restraints that permitted white-collar scofflaws to prey on the investing public in the anything-goes environment that led to the 1929 market crash. Nor does the author place the West Coast racketeers in a broader context that might have prefigured their latter-day counterparts on Wall Street, in Beverly Hills, or elsewhere. The bottom line: a linear take on an oldish rogues-to-riches tale, conspicuously deficient in the resonance that could have made it worth retelling.